Bella Bathurst is a writer and furniture maker. She lives in Wales. Her book Sound: A Memoir of Hearing Lost and Found, will be published by Greystone Books in October. I had a couple of head injuries when I was in my 20s, and, soon after the second one, I started to go deaf. The decline wasn’t immediate – it wasn’t as if one minute I had full hearing and the next I had nothing – but a steady falling-off of sound, day upon day. It would be good to say that it was the decline of childrens' voices or the silencing of my boyfriend's laugh that forced me to do something about it, though to be honest, it wasn’t. Instead, it was the fear of being unprofessional. At the time, I was working as a freelance journalist, and had just started writing my first book, an account of the Stevenson family of engineers. Much of my time was spent in archives going through family papers, but my research also took me out to the darkest corners of Scotland to interview the last generation of lighthouse keepers. Keepers, I soon discovered, fell into two distinct categories: unstoppable, silent. Either all I had to do was switch on the tape recorder and let it flow, or I was there for hours, tweezering out each individual word. But when I transcribed the interviews afterward, I noticed how often I had misheard or leapt in at the wrong moment. Admittedly, some of the interviews had been conducted outside, and lighthouses are high and windy places. Even so, there seemed to be a lot of gaps. All the grace of a conversation had gone, and now there was only a series of jolting observations. I could hear how hard I was trying, but I could hear how hard the keepers were trying, too – the note of bemusement in their voice when I failed to pick up on something they’d said, or came back with something completely unrelated. It was frustrating, sitting there at my desk, turning the volume up on my own mistakes. Every time I listened to one of the tapes, I could hear – at top volume, and as many times as I chose to repeat it – just exactly how many times I hadn’t been able to hear. At the local National Health Service audiology clinic, they told me I was indeed going deaf and that I had already lost around half my hearing in both ears. They fitted me with a pair of hearing aids, and, for the next 12 years, that was pretty much it. 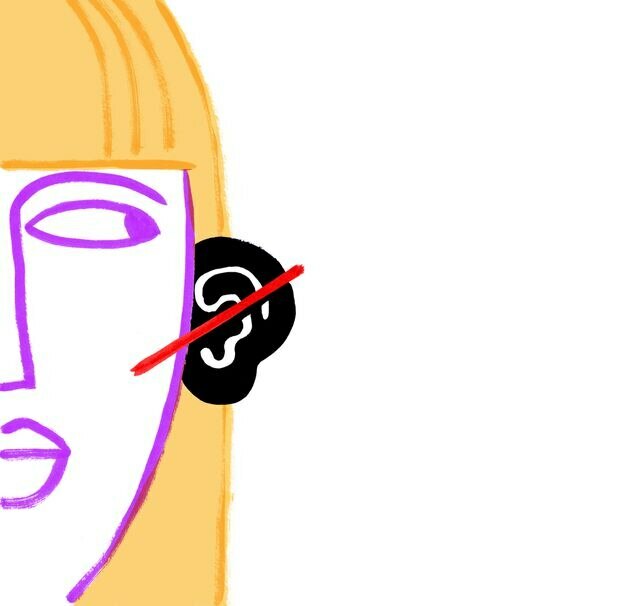 Though I didn’t realize it at the time, deafness is a common problem, as is not talking about deafness. Absolute figures are hard to come by, but in Britain an estimated 11 million people – nearly one in six – have some form of hearing loss. The same is true elsewhere. In Canada, 3.2 million do, and in the United States 20 per cent of the population are partly deafened. In the vast majority of cases, hearing loss is age-related; around 40 per cent of the population over 40 experience hearing loss, and around 70 per cent of those over 70 do. I was among the 2 per cent who had lost their hearing young. But as it slipped away, I realized something odd. I’d just assumed that, as I became deafer, things would gradually just get quieter and quieter, as if every year someone were sliding another layer of glazing into the space between me and the world. But this wasn’t like that. Yes, the volume was definitely going down, but the odd thing was that deafness wasn’t making me less aware of sound, it was making me more. Having been indifferent to acoustics, I was now – well, not obsessed with them exactly, but they certainly seemed to occupy a lot more space in my life. I’d never really thought about the difference between the sound in a room with high ceilings and a room with low ceilings, or why it was that some streets sounded softer than others. Did it really matter if you sat in the big main room of a pub or squeezed into one of the snugs? In hearing terms, was there much of a discrepancy between a double-glazed sixties tower block and a suburban house near a busy road? Lunch appointments were tricky. How could I say I'd rather meet in a place with coleslaw and no atmosphere than somewhere where it might take me 20 minutes to figure out what the waiter had said? Was it better to go to a meeting in a shouty coffee chain and have people think you were a weirdo for staring fixedly at their lips the whole time, or confess and meet on a cold park bench like characters in a spy novel? It seemed like such a small thing but our priorities seemed to be pulling apart: My friends and colleagues wanted to catch up and have something decent to eat. I just wanted to know whether they were speaking English. By 2004, I had a part-time job working in a pro photographic lab in East London, and my regular bus commute took me along one of the city’s main routes, the Marylebone Road. In British Sign Language, the sign for London is the same as for noisy, though by the round-the-clock standards of other great international cities – Mumbai, Buenos Aires, New York – London has a muffled quality. Before I lost my hearing, I’d loved the sound of this bit of the city. The shush of rain under tires over the roar of leaf blowers. The ticking of hot car metal. The unsynchronized click of stilettos. A panhandler, propping himself up against the wall of the bank: “Yous! Gies yer change!” The collective rush of trucks passing. Fragments as people pass: “Most of salami is, like, donkey. Or sometimes horse.” Two armed policemen in stab vests and jackboots, discussing bargains on the QVC shopping channel. The shudder of the Metropolitan Line beneath my feet. Tourists queuing outside Madame Tussauds. Workmen putting up scaffolding; the flat notes of boards and poles being set in place, the chink of the couplers thrown down on the pavement. The rattle of fighting magpies. “Yeah, well, he talks about it so much, it’s obvious he’s a virgin.” Musicians wrangling coffin-sized double basses over the road, yanking at their trolleys before the lights change. Somewhere behind, the diesel-y snort of trains at each station. And far beyond that, the sound of London breathing. In the mornings, I’d sit there on the top deck of the 205, listening to the schoolkids. That was before. And then there was after. Imagine London turned down. Cut out the traffic. Cut the trees and the pigeons. Cut the leaf blower, the trains, the smoothing rain. Cut the air brakes, the scaffolders, the click of heels. Cut the beep of a reversing truck or the bang of its shuttered back. Cut the air-brake exhalation of the bus. Cut the kids outside Madame Tussauds or the chat of passers-by. Cut the angle-grinder’s rushed complaint and the rise of a motorbike’s frustration. Cut the tourists. Cut music. Cut conversation. Cut Korean, Scottish, Arabic, Spanish, English, American, French, Estonian. Cut the occasional shout over the traffic or the bark of a dog. Cut the shriek of a black cab’s brakes. Cut the whole lot. Cut everything except the sirens and the wails of unchanged babies. Or rather, take it all down by about 80 per cent. Take out all of the juice and most of the pith. Remove half the sense and flatten the rest. Leave what remains as a disconnected sequence of hisses and sibilants. The edges of sound are still there but the sense in its centre has gone. I can still feel the vibration of the bus and the windows shaking slightly as it stands. I can see the drills and the grinders but the sound is stopped off. None of this is unpleasant or uncomfortable and, because it’s happened over a long time, I’ve adapted to it. But it is strange. I know some sounds because I catch the end of them, like catching the last words of a well-known quote or phrase. I can hear the edge of a diesel’s idling motor not because I can really hear it, but because my brain knows the sound of it so well it completes the missing phrases. I know the station announcement is a station announcement because of the rhythm and the distance, not because of the words. But other sounds, disconnected from their source and from any surrounding links in the auditory chain, make less sense. Half a word in a sentence. A slice of ringtone. A shout. The closest analogy would be to imagine putting on ear defenders and then listening to a radio on the other side of the room. You can’t hear much, but you can hear the difference between the fenced-in sentences of a news bulletin and the ramblings of chat. If it’s sport, you know exactly where the goals are in a match report or a horse race rising to the finishing post. When it got to the stand at Euston Station, the bus would loiter for a while beneath the concrete canopy. Outside on the forecourt were the usual mixture of travellers, junkies, dog-walkers, tourists, skater kids and students. I’d look out the window at all these different tribes and start to read. Those two, they look like they’re in love but it’s always him who moves toward her. The man with his bag on the ground, talking to the older guy. What’s their relationship to each other? Is there some kind of deal going on? The retired couple standing slightly apart beside their unscuffed suitcases. He moves stiffly, like he can't move his neck, like there’s always something he doesn’t want to look at. Look at the queue for the 68. There’s nine people there. How come some of them really stand out, and some seem always to be part of the concrete? I would watch all of this, and the longer I watched it, the more something became evident. I was seeing all these people, their intentions and anxieties, and, four times out of five, I reckoned I could make a reasonable guess at what was going on. If I looked through the silence – really looked, with the whole of my attention – then I could see the whole hubbub of interaction. I could see the way homelessness rendered men invisible, or the sheer, ceaseless 24-hour hard work the addicts put in to feeding their needs. I could see the gap between who people wanted to be, and where they really were. The odd thing was, I couldn’t hear a thing, but I was having no difficulty in understanding every word. It wasn't sound I was concentrating on any more, it was vision. In here, I could get hooked on looking, I could stare to my heart's content, I could teach myself a whole new communication. I was still deaf, but I had found a way out.